I haven't been able to get onto IRC for a couple days, it always gives me a Connection Refused error. 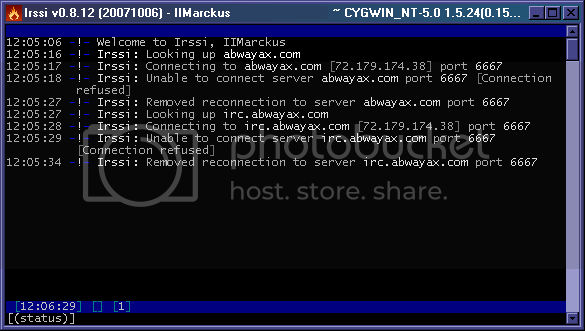 Tried connecting to abwayax.com and irc.abwayax.com, with multiple clients (including the Java one) but always get the same result. I don't like the sound of that. Seems like you're saying "yeah, not really important to me, so just go to allhellpose.ath.cx, meh." As a matter of fact, it's not really that important to me at the moment. That server backs up mine, it's there for a reason. Had there been no backup server I would stay up all night trying to get it working and perhaps getting fussy if I don't. If you're really insistent on using my server you can try the IP of the old machine, 75.1.136.127, where I believe it is still running.